Nevada is perhaps best known as the state where the world’s capital of entertainment, Las Vegas, is located. But, apart from the entertainment business, Nevada is a fertile ground for many other industries. In fact, it seems that any business is bound to be successful in this state. According to the experts on economy of this state, the fate of a company is not determined by the type of business, but by the type of the business person. If you are a hard-working entrepreneur, who approaches every challenge meticulously, you can be sure that the doors to success are open for you in Nevada. Whether you are looking to start a new Nevada business or branch out your existing company, with a good business strategy everything seems possible. The key to developing a superb business tactic is having the right kind of info in your possession. In this particular case, the most important thing you need is the Nevada business directory! For Nevada Companies database, we have a total of 102,487 Nevada businesses listed. 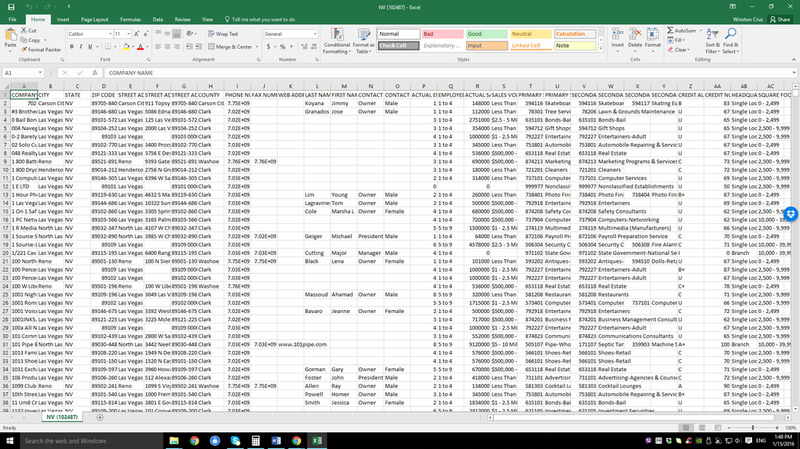 ﻿Compiled Listing of Nebraska Businesses and Companies in Excel Format. Usage: Nebraska Business Search, Nebraska ​​​​​Business Entity Search, Offline Marketing, Sales Lead Generation, B2B Partnerships and other Business related purposes. How to Use Nevada Business Database? Our Nevada business directory comes with a huge number of entries, together with all sorts of valuable details. In fact, there are 102,487 Nevada businesses listed in the database, each of which comes with specifics, such as the business niche description, city and ZIP code where the company is based, actual sales, the number of employees, etc. Furthermore, the list of Nevada businesses also contains contact details of those companies, which includes the email address, telephone and fax number, mailing address, and even the company’s official website. With all of this info in your possession, you will be able to take your business to a whole new level. You can use this data for a number of different purposes, including Nevada business entity search, prospecting, business-to-business, marketing, leads generation, etc. ​What Makes Our Nevada Small Business Directory Better Than the Rest? Apart from coming with all the information you need, the directory is also great as it’s very easy to use. It comes in the form of an XLS/CSV file, which a sort of document that can be opened with Microsoft Excel or a similar sheet-editing program. ​Why this is important is that it allows you to handle the data any way you like. In fact, you can use the Find option to look for a specific Nevada company, while the Sort function will enable you to sort the whole list according to a specific criterion. For example, that criterion can be the city or the ZIP code, the size of the company, or the profit it makes. You can also search from out databases companies from other us states like Texas, Delaware and so on. You can argue that there are many other databases that also come in the form of an Excel file, so what’s the thing that makes our directory better? The answer is that all the data in our list is completely genuine. We collected the data manually, using only legitimate sources. On top of that, every single entry in the database is double-checked and updated, meaning that you will be able to use all of them, for a long time.